Malaysia is the third largest economy in the Association of Southeast Asian Nations (ASEAN). According to the International Monetary Fund (IMF), their Gross Domestic Product (GDP) is expected to be worth US$364.9 billion in 2018, a 16% increase from the 2017. Malaysia has taken steps to digitally transform its economic drivers with a vision of being a global digital economy leader and regional tech startup hub. By 2022, it is forecasted by IDC that over 21% of Malaysia's GDP will be digitalised with industrial growth driven by digital enhancements and integration. The rapid rise in demands is estimated to drive $82 billion in IT-related spending from 2019 through 2022. In line with the country’s vision, the Malaysian government has pushed for multiple accelerators to develop digital solutions and encourage adoption amongst local enterprises. The 11th Malaysia Plan stressed the importance of promoting digitalization and greater adoption of digital technologies by businesses to better leverage the benefits of the fourth industrial revolution (4IR). The 4IR is especially crucial to Malaysia’s economy given that manufacturing accounts for 22.3% of the GDP. As such, the National Industry 4.0 Framework was implemented to provide a comprehensive agenda to harmonise digital transformation efforts in the sector. In line with the framework, the Industry4wrd policy was established by the Ministry of International Trade and Industry (MITI) to facilitate and encourage digital transformation in the manufacturing sector by providing comprehensive and systematic guidelines towards embracing digital technologies. The policy aims to install Malaysia as a strategic partner for smart manufacturing, primary destination for high-technology industries and total solution provider for manufacturing sector and related services in the region. Various schemes were introduced to encourage and support the adoption of industry 4.0 technologies under the policy. Two main schemes are the US$730 million Industry Digitalization Transformation Fund under a Malaysian Development Bank subsidiary to accelerate industry adoption of Industry 4.0 related technologies; and the US$490 million Skim Jaminan Pembiayaan Perniagaan (SJPP) loan guarantee program where the Government will provide a guarantee of up to 70% of the amount financed. In 2018, four goals were established by MITI to support Malaysia’s vision of accelerating industry 4.0 uptake among local businesses. To increase the number of high-skilled workers in the manufacturing sector from 18% to 35%. In January 2019, the Malaysia Productivity Corporation (MPC) was commissioned by the government to carry out Readiness Assessments (RA) on small and medium enterprises (SME), a comprehensive program to determine the suitability and readiness of the firms to adopt digital solutions using predetermined indicators. The project will assist up to 500 SMEs in their transition to industry 4.0 technologies with a US$51 million budget. The value of the RA lies in enterprises being able to craft out feasible strategies for digital transformation based on their capabilities and weaknesses from the metrics of the RA. 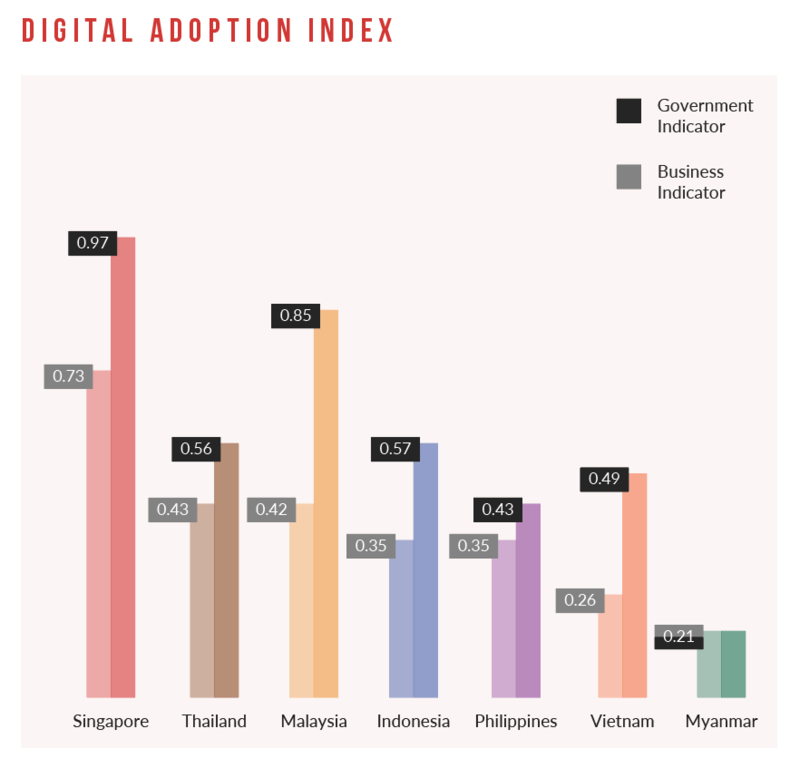 Malaysia is considered one of the most digital-ready economies in ASEAN. However, according to a 2016 World bank Report, Malaysia had the largest gap between Government Indicators (0.85) and Business Indicators (0.42) of Digital Transformation. As such, there has been an increasing focus on investments to increase adoption rate of 4.0 solutions amongst businesses. Measures are being taken to address industry needs such as increasing the pipeline of digital talent, improving the awareness of suitable solutions and engaging industry stakeholders through dialogue and education. At Asia IoT Business Platform Singapore 2019, the winners of the 2018 Malaysia Enterprise Innovation Award, Fraser and Neave (F&N) and FGV Holdings presented their case studies on digital transformation. They highlighted that digital transformation and Industry 4.0 solutions is being embraced by enterprises in Malaysia and that adoption of different solutions by forward looking enterprises will provide reference and inspiration for SMEs to adapt practical solutions to improve their businesses. As part of their digital transformation journey, F&N focused on transforming its distributor claims and sales operations process, so as to improve the efficiency and transparency of its operations. The 136-year-old conglomerate implemented digital platforms and mobility solutions for its workforce. The digital platforms helps provide transparency to stakeholders and the data collected can easily be accessed for further analysis. F&N aims to incorporate more functions into its mobile workforce solutions such as AI and machine learning if current trials prove successful. FGV Holdings leveraged on digital technology to implement an Enterprise Risk Management System (ERMS) to better manage risks on their plantations and properties. At Asia IoT Business Platform Singapore 2019, FGV’s Chief Risk Officer spoke at length about the implementation of the system in 2008 and how the system has constantly evolved. In 2018, the system overhauled its metrics and framework of risk assessment to be more efficient and effective. FGV aims to standardise its risk assessment process across its subsidiaries using a hierarchy structure to ensure consistency. The new system also features correlation analytics between several assessed factors and mapping functions to better illustrate analysis. Malaysia is looking at partnerships and collaborations with more tech-advanced countries and global corporations for assistance in developing frameworks, investments and talent development. Under the Look East Policy (LEP), Malaysia has benefitted from Japanese investments and expertise in various sectors such as manufacturing and engineering. The two countries look to develop a more relevant and forward looking LEP 2.0 which will have more emphasis increasing trade and investments for priority areas as well as training and education. Malaysia’s ambassador-designate to Japan stated that LEP 2.0 will expedite Malaysia’s adoption of Industry 4.0 with industries such as halal foods, aerospace and healthcare being key drivers. Other forms of collaboration include the signing of a Memorandum of Understanding (MoU) between MIMOS Berhad and Microsoft Malaysia in December 2018 as part of the government’s efforts in reaching out and tapping on the private sector for help in digital transformation. The partnership will see the establishment of Artificial Intelligence (AI) and Internet-of-Things (IoT) schools across the country to train up local talents in these areas and aims to create a sustainable talent pool for businesses to draw upon. There will also be an AI and IoT-focused lab that runs on Microsoft programs to be set up in MIMOS to facilitate R&D efforts. Microsoft will also partner MIMOS to conduct workshops for young entrepreneurs and graduates for better leverage of AI and IoT technologies. As Malaysia continues to create a conducive environment to capitalise on the fourth industrial revolution, you can be part of the discussions by sharing your thoughts with key stakeholders and gain further insights on the digital transformation strategy and initiatives at the Asia IoT Business Platform 2019. Drop us a note at info@industry-platform.com or learn more at http://iotbusiness-platform.com/register/ to be part of the enterprise digital transformation conversation in ASEAN.